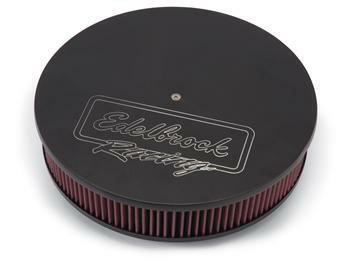 Edelbrock Victor Series air cleaners feature a die-cast aluminum lid that is black powder coated with a finely textured surface for a pleasing and unique appearance. This is the same finish you’ll find on our other new Victor Series accessories. These air cleaners work with all popular 5-1/8” carburetors or 4-bbl. throttle bodies and includes a knock-out in the base along with an adapter for crankcase ventilation. They come with medical grade, pre-oiled cotton gauze element for excellent filtration. Number in parenthesis is overall height from base to top at the highest point.